Remember the suave go-getter Subbu from Thiagarajan Kumararaja's Aaranya Kaandam? The one who orchestrated the entire crescendo of catastrophes with a smile hiding a tear, and tears masking a smile. Remember the patient yet manipulative Chandra from Vetri Maaran's Vada Chennai? While a revenge story from a woman's perspective might not be new in Tamil cinema, what if the female lead doesn’t want to wait for years to exact justice? What if she doesn’t want to just keep scheming on the sidelines? What if she isn't content being just the judge and the jury? 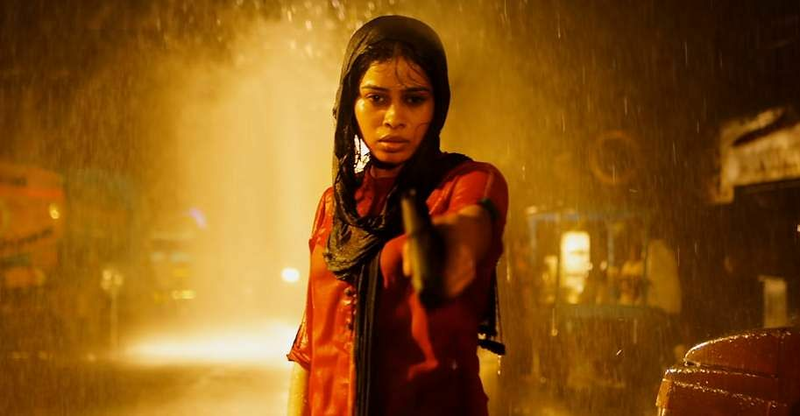 ‘Hell hath no fury as a woman scorned,’ goes the old saying, and in Gangs of Madras (GoM), it is not so much about the gangs and Madras, as it is about the bloody, gory, and cathartic hell that Raziya (An effortlessly brilliant Priyanka Ruth) unleashes on the gangs that wronged her. GoM is the story of Jaya and Ibrahim (Ashok). There is a no-frills religious conversion that enables Jaya, now Raziya, to marry Ibrahim, which, of course, makes her a family outcast. While Raziya's immediate acceptance of another religion does feel out of place, it does usher in an important punch line about how despite being true to both religions, none of the gods came to her rescue when she needed it the most. "Namakkaana nyaayatha naama dhaan thedanum" (We have to seek the justice we need), she says. And it is this justice that is denied to her by the gang led by Mohammed Rawther (a menacing Velu Prabhakaran) and his sons, Karim and Hussain. Rawther is someone who doesn't flinch before pouring a flammable liquid down the throat of an adversary and lighting it on fire. The other warring gang, led by Boxie (Daniel Balaji letting his hair down in a role that is similar to Vada Chennai's Thambi, but with more pizzazz and less intensity), is at loggerheads with Rawther and Co over maintaining the drug-trade monopoly in the city. Of course, there are cops waiting for the right time to strike, and the cliched corrupt politician at the centre of everything. For a film about revenge, drugs, and gangsters, the 'A' certification fits perfectly. In GoM, almost none of the killings are happenstance and neither are they just by a swift knife slash or a single gunshot. Every murder is calculated, visceral, gory, and brutal. As the film progresses, it only gets bloodier and doesn't shy away from showing the violence as is. You see every strike, you feel every blow, you flinch at every impact, but you just can't take your eyes off screen. Be it the way it is shot by cinematographer Karthick, or the impressive background score by Shyamalangan, the violence in GoM is clearly its calling card. However, even as his well-written characters take centrestage and deliver telling performances, there are times when producer CV Kumar's second directorial after Maayavan becomes too indulgent. He tries to infuse a lot of subplots into this revenge saga, but they take away the focus from Raziya, and the novelty factor takes a hit. A random preachy scene about the psyche of the henchmen, though interesting, feels forced into the narrative. The drug trade angle is not new. The double crossing is not new. Neither are the proverbial twists in the tale. But, thankfully, whenever the spotlight is shifted back on Raziya, Gangs of Madras is on firm footing. And how good is this actor! She gets punched, she gets kicked, she gets slapped, she gets her head smashed against a wall, she gets flung across a room, and every single time, she comes back with an intensity that belies her experience in front of the camera. The story of Gangs of Madras might be predictable in nature, but again, which revenge saga isn't? CV Kumar is generally known for his small-budget films that, more often than not, turn out to be game-changers, and by telling a done-to-death story through the fiery eyes of Priyanka's Raziya, he has given this genre a much-needed fillip and has delivered a film that has all the potential to be one.